For a vicarious shopping event, see Wendy’s blog about her recent shopping spree; it won’t cost you a dime! I love it when I’m simpatico with the sales person and each fabric she brings out is better than the previous and each one inspires another garment in a direction you weren’t even remotely considering. Like Wendy’s embroidered silk when she needs/wears more casual clothes. “Some sewists are very good at only buying fabric for a current project and not having a stash. But for the majority of us, at some point we’ll see some beautiful fabric and we’ll succumb to buying it without a project in mind. And then it will probably happen again. OK, back to the purpose of this post–one of the fabrics Wendy bought was inspired by a shirt in the store window and she already had the pattern so, a no brainer, add it to the pile. Turns out the shirt is a vintage Issey Miyake pattern (1476) from 1984. 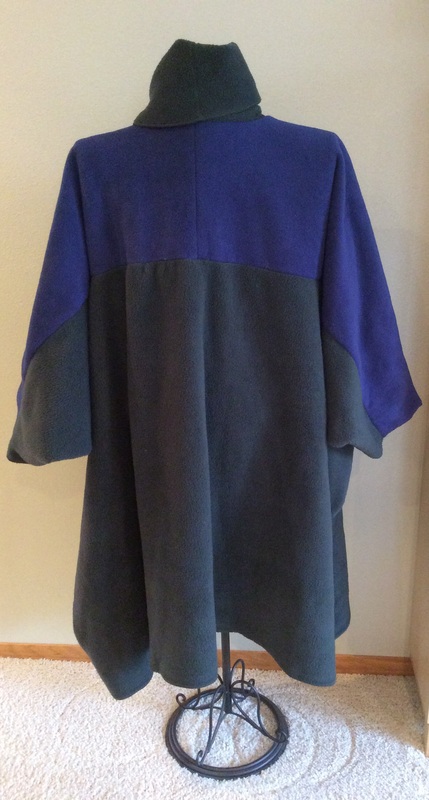 Unlike Wendy, I have made the cloak and it is now 20 years old and still in my closet. 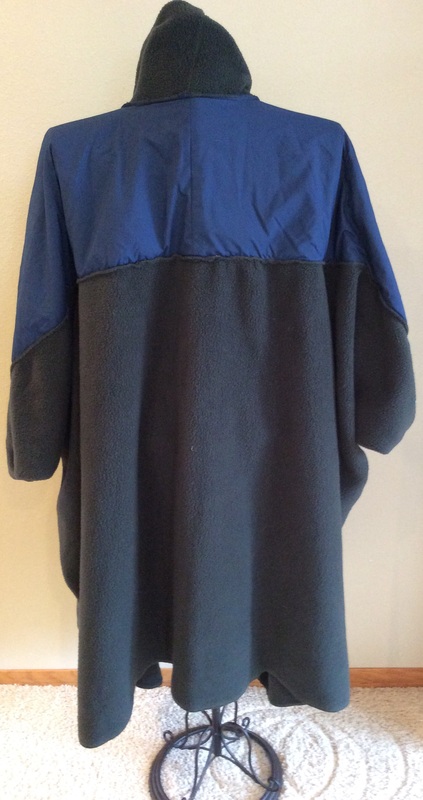 I made it in polar fleece as it was the most practical and inexpensive fabric. 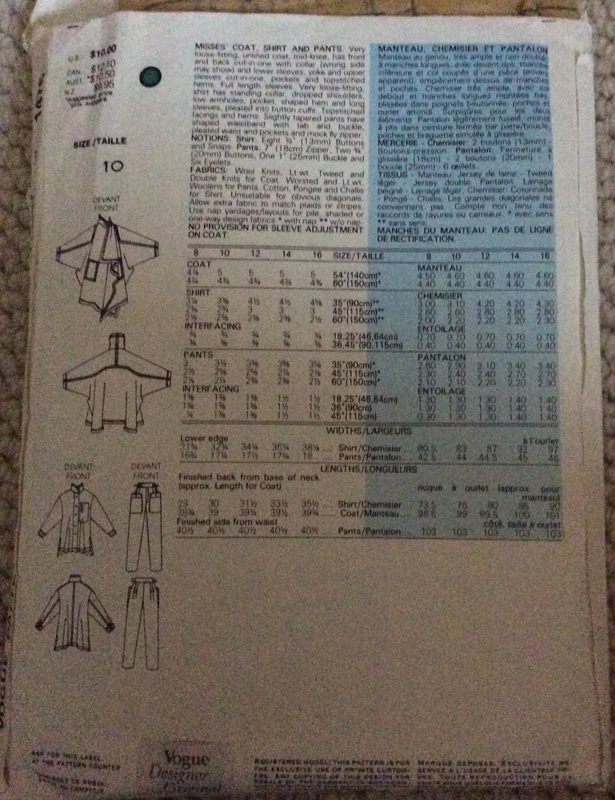 It requires almost five yards of 60″ width. The yoke is lined with a water resistant nylon as the shoulders would be the area first hit by rain. This was made for a football game attended at Brown University when my daughter was a freshman (1991). Can’t imagine how I got it there from Minnesota, but, those were the days before checked bag charges. It was/is the perfect bleacher garment to wrap in–even the feet. About that game–an Ivy League football game is nothing like Midwest games with uniformed, blonde cheerleaders, mascots and Marching Bands. I remember the ‘band’ wore trench coats and played jazz–no Sousa marches there. Anyway, I looked great and was warm! 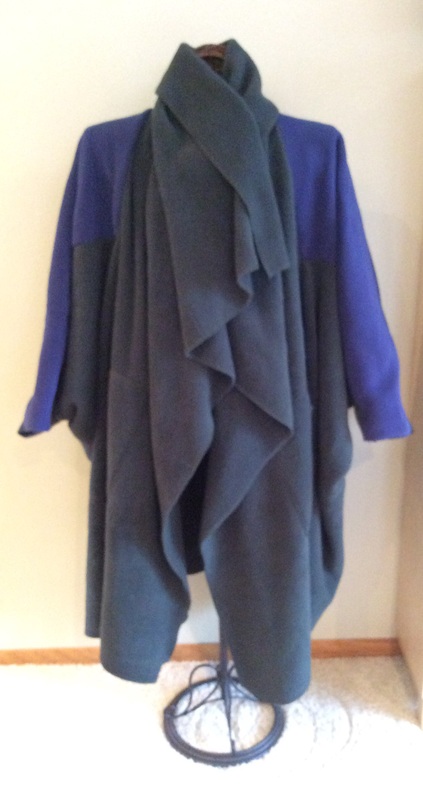 The garment is serged and is easy to sew other than dealing with massive amounts of fabric. And, it is HEAVY. even in polar fleece. Wool coating fabric would be even weightier. Have worn it to many MN football and hockey games and, as I said, it’s a great back up as a blanket in the car or on the airplane. That is a great looking shirt; am sure there is the perfect fabric in my stash. 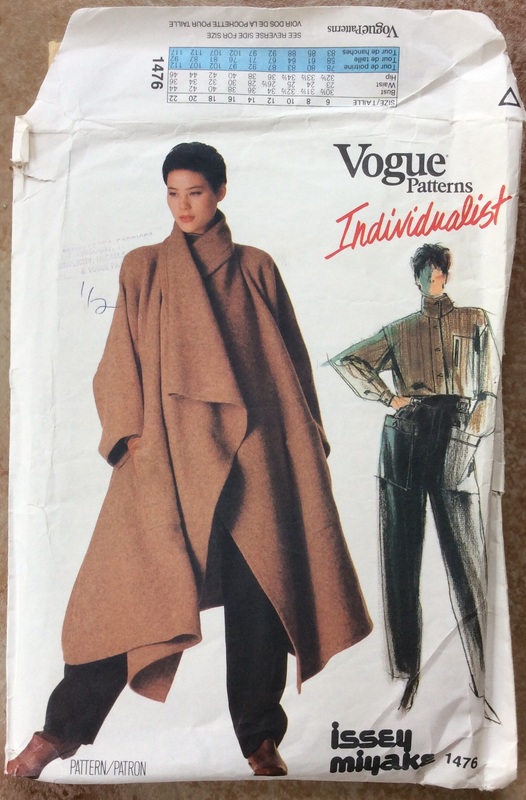 This entry was posted in FIBER FASHION FUN and tagged cloak, Issey Miyake, polar fleece, vintage, Vogue Pattern 1476. Bookmark the permalink.